A $250 million brewery of the International Breweries Plc is scheduled to be inaugurated next week Tuesday in Ogun State in south-western Nigeria. The Plant Manager of the brewery, Mr. Tony Agah, told journalists during a media tour of the brewery at Km 3 Flowergate Industrial Scheme, Sagamu-Abeokuta Expressway on Monday that the IB Plc is part of the AB InBev Group, the world’s largest brewer. 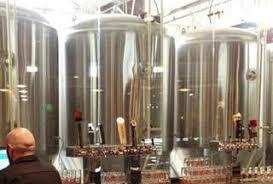 The new brewery, according to him, is the fourth plant to be established in the country by the company. The IB Plc has three other plants in Ilesa in south-western Nigeria and Onitsha and Port Harcourt in south-eastern Nigeria. He explained that the new plant is one of the Foreign Direct Investment which came into the country in the last two years. Local media reports quoted Agah as saying that the first phase of the development of the plant had been completed with more than 300 Nigerians were already employed. “Given the importance of this event, the President and Commander-in-Chief of the Armed Forces, Federal Republic of Nigeria, Muhammadu Buhari, is expected to perform the inauguration of the facility. “The Governor of Ogun State, Senator Ibikunle Amosun, will be hosting all of us, as our landlord. Other eminent Nigerians and officials of AB InBev, especially the global CEO, Mr. Carlos Brito, will lead the celebration. “The new brewery will be the company’s largest plant within the group in Africa outside the one in South Africa. This will have a significant multiplier pact on the value chain within Ogun State and its environs. “As it will provide direct and indirect employment, make available global brands locally and support Nigeria’s foreign direct investment aspiration,” he said. Speaking on the inauguration of the plant, the Managing Director of IB Plc, Annabelle Degroot, said that the plant was a major step towards the company’s strategic goal of producing high-quality drinks locally.